When you first have a child, sharing the happy news is at the top of the priority list – after the baby, of course! But you may also ask "When can I take my newborn in public?" That’s long been a cause for debate, and many experts have weighed in. While it might be wonderful to stay tucked away in your little cocoon at home, eventually you will have to introduce your baby to the world. Here is when you can do this, and some precautions you should take. Many years ago, newborns were considered too fragile to be out in public, and so they were kept inside for many weeks or even months. In some cultures today, it is still common to keep a baby hidden away for several weeks. The good news is that there is really no reason not to take your baby out of the house, as long as you follow some clear precautions. Many parenting experts say that it’s okay to take your baby out, but you should avoid crowds at first. There are many reasons for this – besides the loud noises and bright lights that come from the public areas, there are many germs floating about. You are accustomed to these germs, but your baby’s immature immune system is not. That’s why it is important to avoid those crowds for the first few weeks, if not the first few months of life. But taking your baby out in public is not a bad thing, as long as you do avoid those crowds. 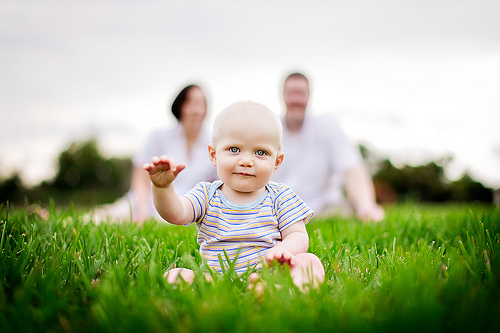 In fact, the fresh air of a leisurely walk in the park or a quiet picnic in the backyard can be wonderful ways to get your baby out of the house and introduce them to the world. It also gives tired parents a chance to get out and breathe deeply of the fresh air, which can be great for the morale and spirit. Taking your baby out when she is in the mood to look around and see the world is great; taking her out when she is sleepy or doesn’t feel well is usually a bad idea. Try taking her out after she has been fed and has a fresh diaper. The temperature of the air outside makes a big difference in how well your baby can tolerate it. Staying in on the hottest summer days and the coldest of the winter can be the best bet for keeping your baby healthy and happy. Are you going out somewhere for longer than a few minutes? Then be ready to handle naptime, feedings, and other things that your baby might need while you are out. There is where a fully-loaded diaper bag comes in handy! Just as you want to be prepared when you go outside, make sure your baby is dressed the right way, too. Cover her hands, feet and head when it’s cold outside. Use the same number of layers you might wear, but add an extra, just in case. When it’s sunny outside, remember to keep the layer of clothing light, and stay in areas of shade. When it’s really hot, use lightweight clothing and be sure to protect carefully from the sun in a brimmed hat or umbrella stroller. If it’s too cold, rainy, or humid, stay inside. Remember, your baby’s immune system isn’t as good as yours just yet. So avoid crowds, such as shopping malls, discount stores, concerts, and airplanes or airports. If you absolutely must go to these places, make sure your baby is well-covered and try to keep your distance from others as much as possible. If anyone is sick or has recently been sick, keep your child away from them as much as you can. This includes avoiding birthday parties where other children have the sniffles, malls and churches or other places where people congregate often, and any family get-togethers that might include people who are just getting over a cold or otherwise have illnesses that could be transmitted to your baby. People want to touch newborns – they can’t help it. Maybe it’s that soft baby skin, or the sweet smell, or just the “aww” factor of a beautiful new baby. But don’t allow your baby to be touched, especially by strangers, no matter how well-meaning they are. Don’t be surprised if someone gets upset with you over this rule, but stand your ground. Make it clear that you want to keep her as healthy as possible, so anyone but immediate family needs to stay back a bit during those first few weeks. Even if your baby is not touched, you could be – and that means that you can pick up germs. Remember that even touching the door handle of your car, the doors of the church or anything else can transmit germs to your skin. Keep a hand sanitizer in your pocket, in your car, at home, and even in the diaper bag, and use it often. Clean things that you might not think of automatically, such as the handles of your stroller or the sides and bottom of your diaper bag. With a little care, you can make sure that your child doesn’t come into contact with germs before her immune system is ready to handle the outside world.